With the 15th anniversary in progress, and a third game on the horizon, the video-game world of Kingdom Hearts is as magical as ever! 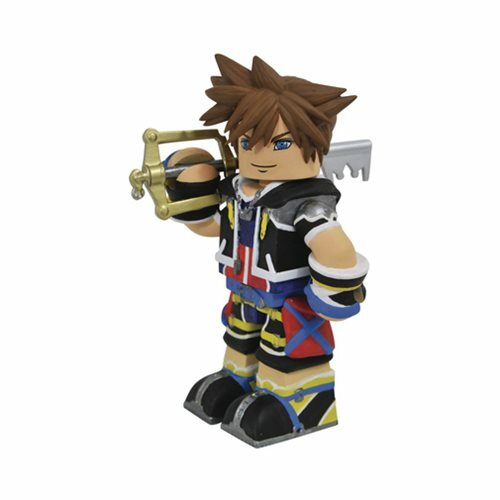 Sculpted in the iconic Vinimate style, this pre-posed figure of Sora features authentic game details and includes articulation in his head for additional posing options. Don't forget to collect his loyal friends (sold separately) to create the ultimate Vinimate collection. This Kingdom Hearts Sora Vinimate Vinyl Figure measures 4-inches tall and comes packaged in a full-color window box. Ages 13 and up.